"Frequently it is the commonplace tasks that have the greatest positive effect on the lives of others, as compared with the things that the world so often relates to greatness. 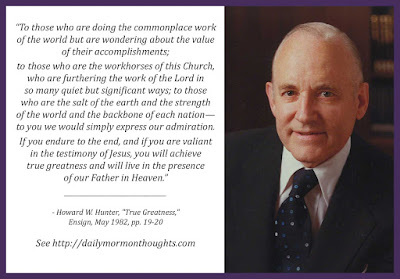 "It appears to me that the kind of greatness that our Father in Heaven would have us pursue is within the grasp of all who are within the gospel net. We have an unlimited number of opportunities to do the many simple and minor things that will ultimately make us great. 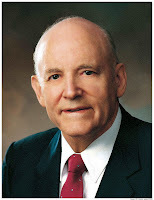 To those who have devoted their lives to service and sacrifice for others and for the Lord, the best counsel is simply to do more of the same. 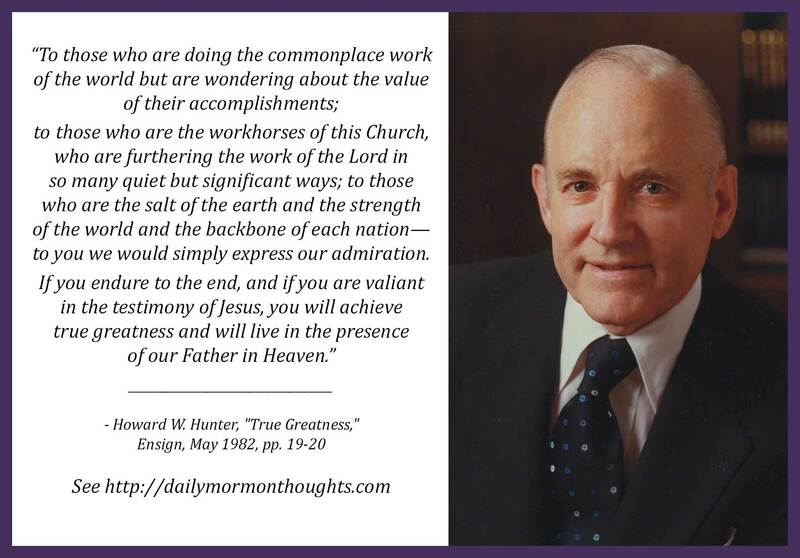 "To those who are doing the commonplace work of the world but are wondering about the value of their accomplishments; to those who are the workhorses of this Church, who are furthering the work of the Lord in so many quiet but significant ways; to those who are the salt of the earth and the strength of the world and the backbone of each nation—to you we would simply express our admiration. If you endure to the end, and if you are valiant in the testimony of Jesus, you will achieve true greatness and will live in the presence of our Father in Heaven." "I'm nobody special. I'm just a plain, simple, ordinary person." While "the world" may have a definition of greatness that involves public recognition and grand visibility, that's not the Lord's way. President Hunter explains that in many cases it is the performance of "commonplace tasks" that makes a greater difference in the long run. Quiet acts of service, simple efforts to bless and lift others, consistent performance of duties—these are things that really matter to the Lord. And we each have so many opportunities to fill our lives with goodness: "We have an unlimited number of opportunities to do the many simple and minor things that will ultimately make us great." That's a great tribute and a great challenge to faithfulness. To endure, to be valiant in the "commonplace work" we are assigned is what really matters, even when it goes largely unnoticed!